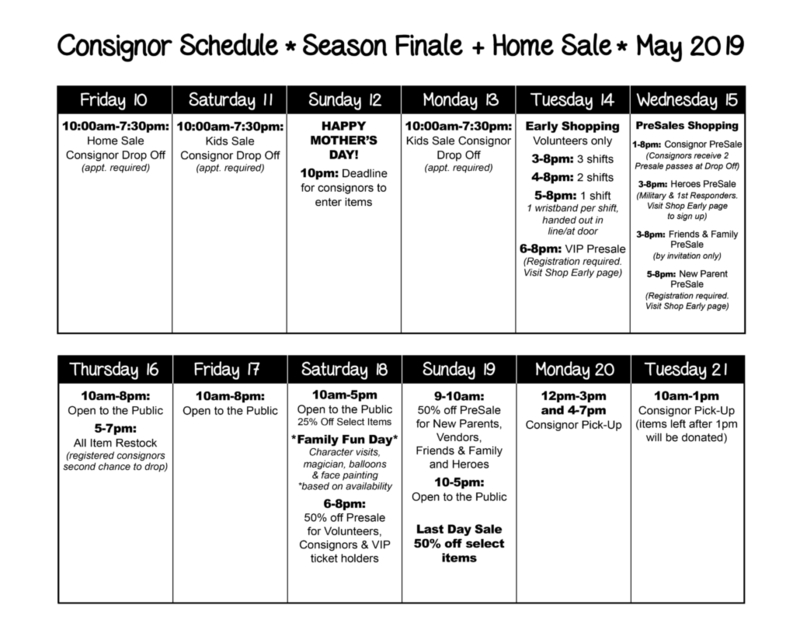 Shop before the public (best selection & prices) at our Consignor PreSale on Wednesday. You’ll get 2 Consignor PreSale Passes when you Drop Off your items. Share one with a friend! NEW! Consignors may invite their friends & family to our new Friends & Family PreSale on Wednesday! We reach thousands of shoppers in a single weekend so you don’t have to. No haggling with strangers. Checks are mailed within 2 weeks of the sale! Choose a sale/location. Register & pay $15 online and choose a drop-off appointment. Prep, tag & price your items according to instructions on Item Prep, Tags & Pricing page. PREPARE your sale items by washing, ironing, etc. to make them look as close to new as possible. Gather the “tools” you’ll need to tag and/or package your items. A list of these “tools” can be found on our Item Preparation page as well as tagging instructions & pricing guidelines. Log in with your consignor number and password. Enter your sale items into the inventory & tagging system. Print your bar coded tags and attach them to your items. Organize your items by type, gender & size. Carefully read through the Item Prep,Tagging Instructions & Acceptable/Unacceptable Items pages under the Consignor tab. Any items that don’t meet our sale guidelines will not be accepted at Drop Off. Drop off your items at the sale location during your Drop Off appointment. DROP OFF your prepared & organized items at the sale during your designated Drop Off appointment time. To sign up for a Drop Off appointment select the link on our Drop Off page after you have registered as a consignor. Pick-up your unsold items (or even better, donate to charity) during designated Pick Up hours. PICK UP your unsold items at the end of the sale. Although we strongly recommend donating any unsold items, we understand wanting larger items back if they do not sell. But do you really want toys, clothes & gear back after you’ve already cleaned out the closets? We will be happy to donate them for you to local charities that serve families in need. Any items that haven’t been picked up by the end of the Pick Up time will be donated to charity. Cash your BIG FAT earnings check! And enjoy your clutter-free closets and garage! FOLLOW THESE STEPS TO ORGANIZE YOUR ITEMS -BEFORE DROPPING OFF- TO ENSURE A QUICK & EASY DROP OFF! Print our DROP OFF CHECKLIST to make sure you’re prepared for your Drop Off appointment. Consignors who have 10 or more items that DO NOT meet ATG’s requirements at Drop Off, will be placed on probation and limited to consigning 50 items (or less) at our next sale. The probation will be lifted when the consignor brings in 50 items (or less) that meet the ATG requirements. Thanks for your cooperation in making this the highest quality shopping event! Consignors MUST make a drop off appointment online by clicking on the link below (the link will not work in between sales). If you have over 200 items to consign, schedule one appointment per 200 items consecutively (back-to-back appointments). Drop Off will take place at the sale location. Drop Off appointments are every 15 minutes. Please be punctual or you may have to wait. CONSIGNORS WILL COLLECT THEIR OWN ITEMS AT PICK UP AND CHECK OUT WITH A TEAM MEMBER PRIOR TO LEAVING THE BUILDING. THERE WILL BE LESS ITEMS TO LOOK THROUGH ON TUESDAY. Be prepared to show I.D. at the check-in table. If picking up each unsold item is important to you, please print & bring a copy of your Unsold Items Report (make sure your inventory report is accurate though, no fun looking for something you never dropped off!). Sales reports updated Sunday night by 10pm. Limited number of shopping carts available, so please bring a stroller, wagon, etc. to help you collect your items. Unacceptable Items: Sometimes we have to remove items from the sale due to defects, stains, etc. We do our best to mark the reason it was deemed “unacceptable” on the tag before placing out on the floor for Pick Up. Sending someone else? If you’re unable to make the scheduled Pick Up time, you can make arrangements to have someone else pick up your items for you. Email us at helpSO@astheygrowsale.com with “Pick Up Substitute” in the subject line and let us know who will be picking up your items. They’ll need your consignor # and ideally your Unsold Items Report so they know what to Pick Up. We only release checks to spouses with same last name & address. Merchandise not picked up by the end of Pick Up (Tuesday at 1pm) will become the property of ATG and will be donated to charity. Want to shop before we open to the public, for best prices & selection? Even if you’re not a consignor or volunteer, you’ve got options! Get first dibs on our great selection of new & gently-loved baby & kids items by shopping early.